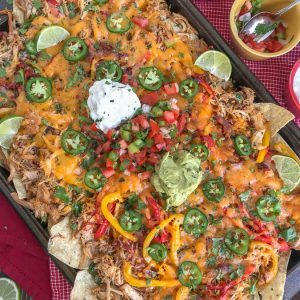 Loaded Chipotle Chicken Carnitas Nachos – more than likely the easiest, most flavor-packed nachos you will ever make! 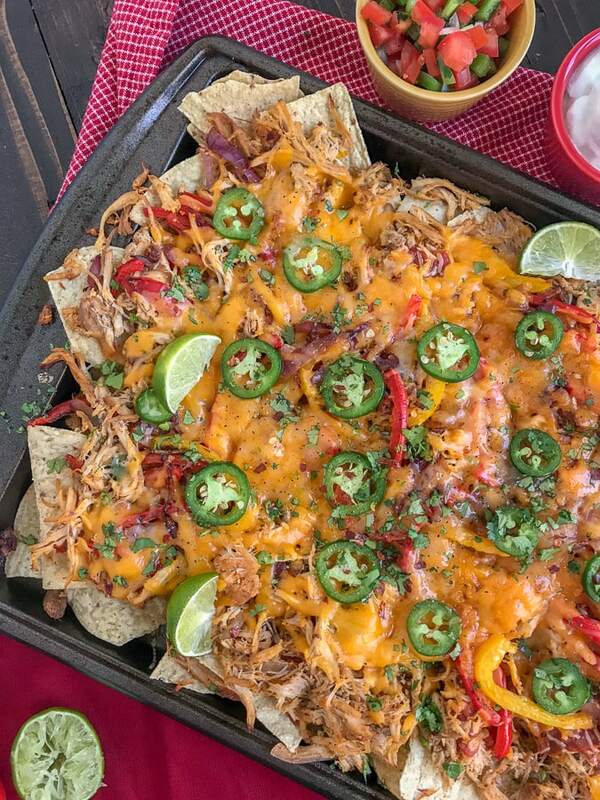 These nachos are loaded with chipotle chicken carnitas, salsa, cheese, sautéed onions and peppers, jalapeños, and topped with some amazing dips! Every day is Taco Tuesday! If you’re looking for the perfect appetizer or meal for the next Taco Tuesday or even for Cinco de Mayo – then look no further! This is the recipe you are going to want to make! Not only for how incredibly delicious it is, but also because its incredibly easy to make. The crockpot does most of the work. The only thing you have to do is prep, layer, bake… and obviously devour! 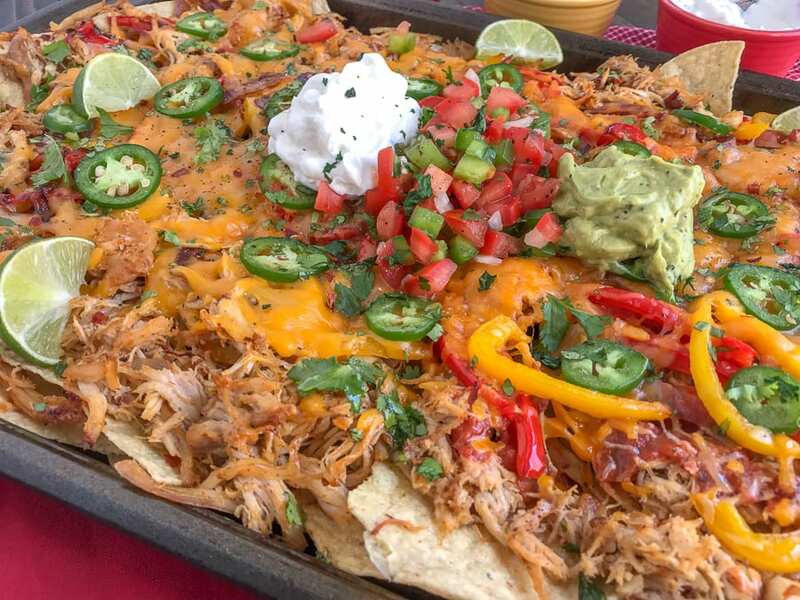 Who can say no to nachos when they are fully loaded like this? Not me! It was certainly an ordeal in waiting… trying to get the correct setup and photos that I wanted before sinking my fingers and teeth into this pan from the food gods! 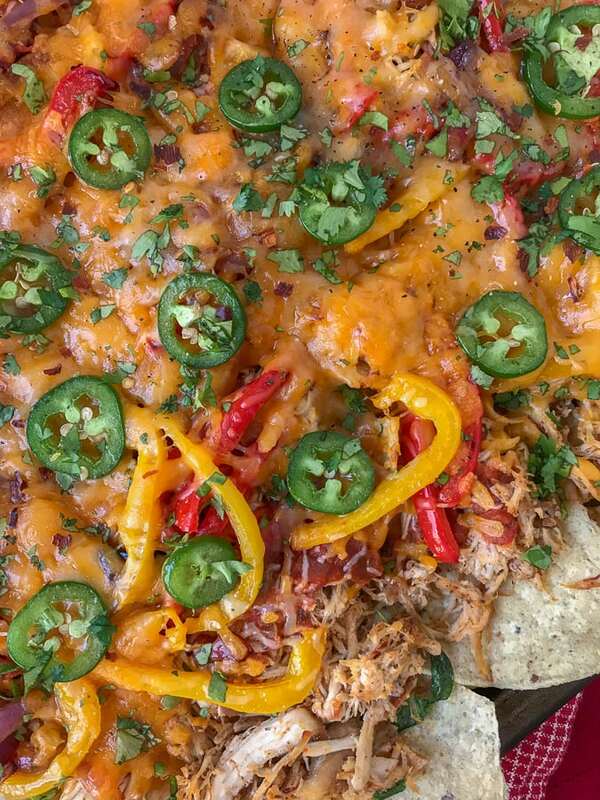 I loved every single thing about this recipe, from the Easy Crockpot Chipotle Chicken Carnitas as they came out of the crockpot, to the layer of cheese on top! Because cheese makes everything better, am I right? Show of hands. Come on. No one is going to see you. Or we can simply silently agree and salivate. 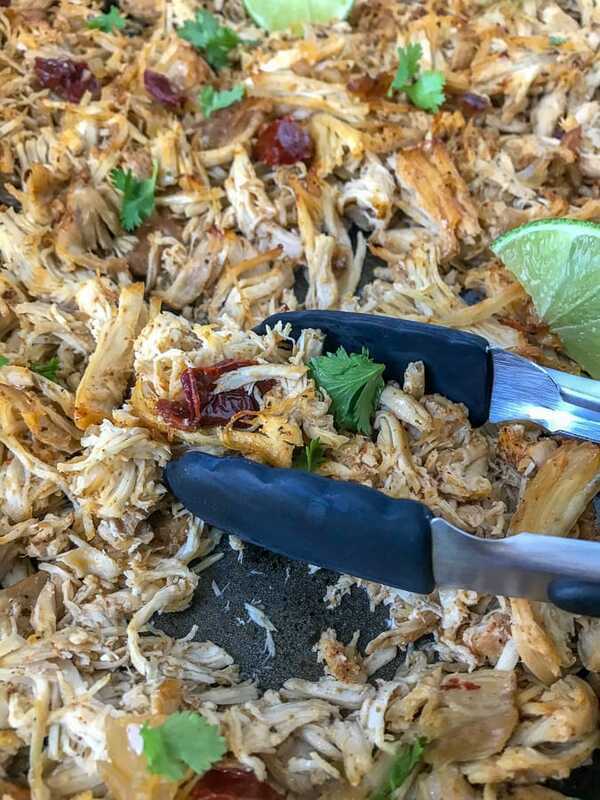 Speaking of salivation – when the chicken carnitas are close to finishing in the crockpot, the smells that fill your kitchen and home are going to knock your socks off. Literally. Knock. Your. Socks. Off. Nachos That Hit The Spot! It’s recipes like this that make me wish my tummy was a bottomless pit. Because hitting that fullness threshold of discomfort always means its time to quit. It’s like getting to the bottom of a bowl of ice cream and scraping along the edges because you’re too sad to admit to yourself that you’ve come to the end. 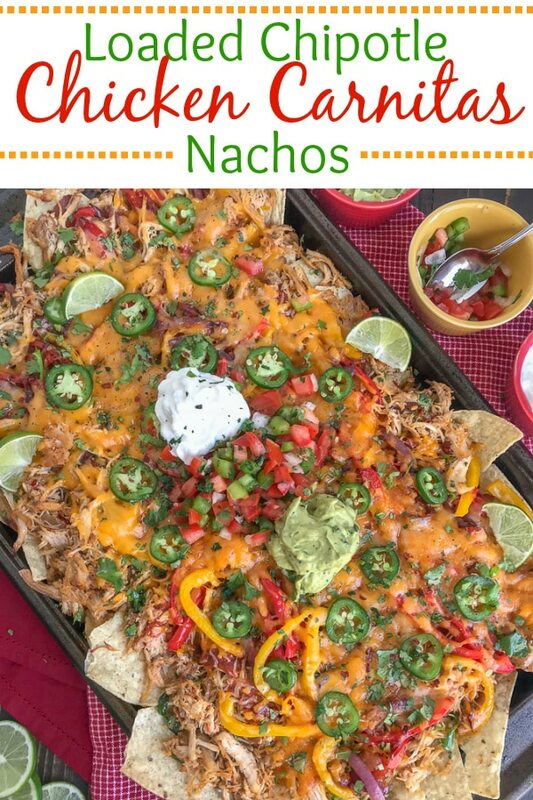 These nachos are made with my Easy Crockpot Chipotle Chicken Carnitas, but you can easily substitute the chicken for the traditional pork. My version contains half chicken breast and half chicken thighs. You can also use either or: all chicken breast or all chicken thighs. Mixing it up with chicken thighs will add a bit more tenderness and flavor to the carnitas as it is the darker, more fattier cut of meat – unlike the chicken breast. Both will still be extremely flavorful. I topped the carnitas with store-bought salsa. You’re more than welcome to use any kind of salsa you prefer. I do recommend using a thicker, less watery version. The salsa will sit on the chicken, but also on top of the chips. You don’t want any soggy chips! Jalapeno slices are completely optional, but I do recommend them for flavor and if you like a bit of a kick to your meals. 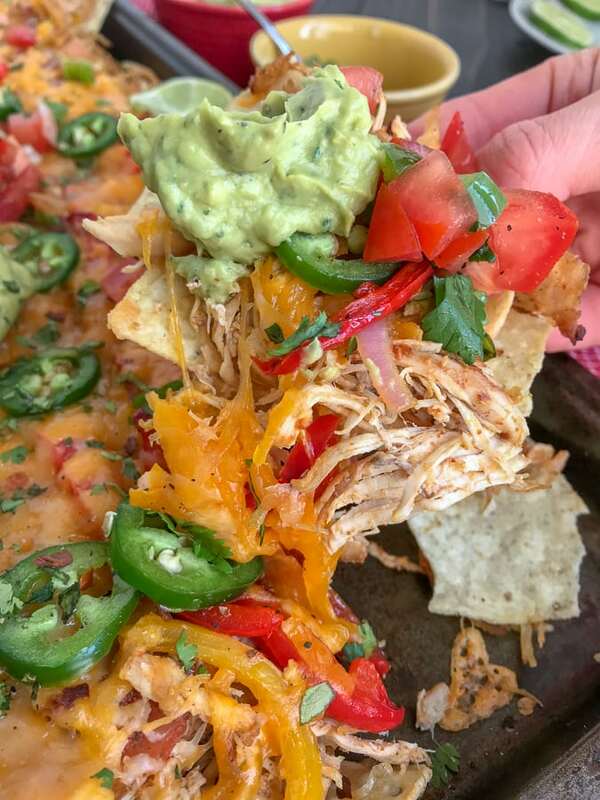 Because I’m still dreaming of these nachos…. one too many closeups are never enough. Salsa. Sautéed peppers and onions. Jalapeños. Cilantro. Cheeeeese. So many wonderful things. I topped/dipped my nachos in plain Greek yogurt (can sub with regular sour cream), a wonderful chunky tomato and bell pepper salsa, as well as a creamy cilantro lime avocado cream. Amazing. But you’re more than welcome to use the dips and sauces of your choosing! Loaded Chipotle Chicken Carnitas Nachos - more than likely the easiest, most flavor-packed nachos you will ever make! 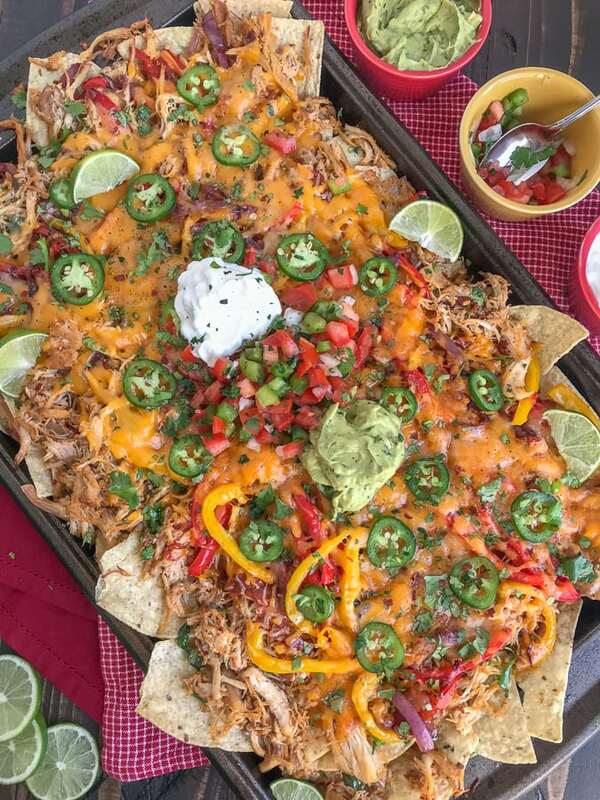 These nachos are loaded with chipotle chicken carnitas, salsa, cheese, sautéed onions and peppers, jalapeños, and topped with some amazing dips! Cook the carnitas according to the directions. It's best to get them started early in the morning or the night before, depending on when you're looking to have this ready by. Once the carnitas are shredded and ready to go, cover them with aluminum foil to keep warm. Place a medium nonstick pan over medium heat with 1/2 tablespoon of olive oil. Once heated, add the sliced peppers and onions. Allow to sauté until the peppers have softened and the onion is translucent. Approximately 5-6 minutes. While the peppers and onions are sautéing, combine ingredients for the Tomato Bell Pepper Salsa. Place into the fridge until ready to dip. Spread the tortilla chips out onto a large, lipped baking sheet. Make sure to cover from corner to corner and not leave any open spaces or gaps. Next spread out the chicken carnitas evenly followed by the salsa. * I used a spoon to spread the salsa over the carnitas. Place the sautéed peppers and onions on top, followed by the cheese and jalapeño slices (if using). Bake for 5-10 minutes or until the cheese has melted. While you're waiting for the cheese to melt, combine the ingredients for the Creamy Avocado Dip in a small mixing bowl or food processor. Cover and set aside until ready to use. You will want to make this dip last, as avocados tend to turn rather quickly. Remove the nachos from the oven and garnish with chopped cilantro and a squeeze of fresh lemon juice. Serve with the Fresh Tomato and Bell Pepper Salsa, plain greek yogurt, and Creamy Avocado Dip. *I only added 1/2 cup of chunky salsa. It will not cover all of the nacho areas, but I wanted to avoid the possibility of soggy chips. You can omit adding the salsa, but I think it incorporates very well mixing with the carnitas!